Bishopwearmouth, on the south side of the River Wear, forms the city centre of modern Sunderland and developed from a settlement called South Wearmouth. It is linked to Monkwearmouth, across the river, by the Wearmouth Bridge of 1929. The present Wearmouth Bridge with the railway bridge to the rear : Photo © David Simpson. The bridge, designed by Mott, Hay & Anderson replaced an earlier bridge of international renown that was once the most famous bridge in the region. The predecessor of the current Wearmouth Bridge was an iron bridge dating from 1796 that was one of the most famous in the world. 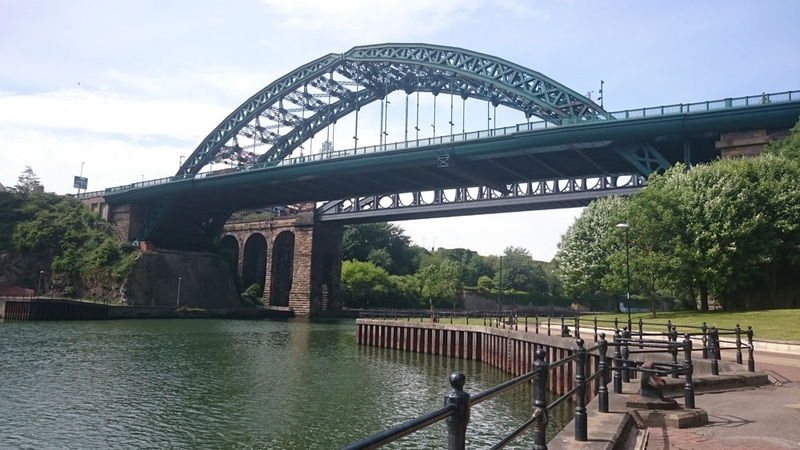 This earlier bridge was only the second cast iron bridge built in England, following on from the famed Ironbridge of Coalbrookdale in Staffordshire but the Wearmouth Bridge was twice as long and in its time was the biggest single-span bridge in the world. Described as a “triumph of the new metallurgy and engineering ingenuity” it was built by local industrialist Rowland Burdon of Castle Eden. Burdon, who was the MP for County Durham, purchased sections of a bridge from an iron company in Rotherham. These sections, designed by the engineer and renowned radical, Thomas Paine, were intended for a new bridge across the Schuylkill River in Pennsylvania in the United States so the sections had to be modified for Wearmouth. The American businessman who originally ordered the bridge went bankrupt, enabling Burdon to make the purchase. 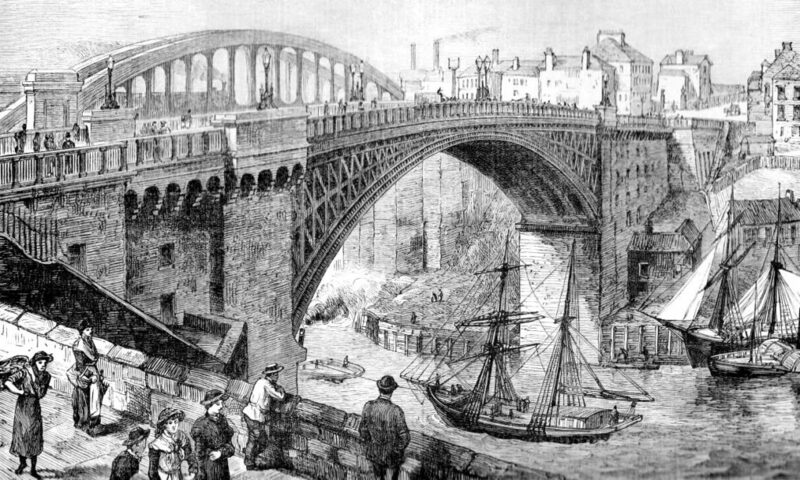 Sunderland’s bridge was considered something of a wonder. It attracted curious visitors from far and wide including foreign dignitaries and was commemorated on thousands of souvenir pottery items manufactured by Sunderland earthenware firms. The bridge opening was a significant event in Sunderland’s history because it brought together the communities on the two sides of the River Wear that were previously only linked by ferry. Hail Burdon in his iron boots, who strides from shore to shore! Poor Rowland may o’er stretch himself, in striding ‘cross the Wear. Should put on larger iron boots, and stride across the sea ! And foll’wing Burdon’s iron plan, from Calais stride to Dover. In the 1850s Sunderland’s iron bridge was considerably modified by the Tyneside engineer Robert Stephenson but continued in use until replaced by the present Wearmouth Bridge in 1929. Like the earlier bridge, the Wearmouth Bridge has the railway bridge of 1879 as its companion.